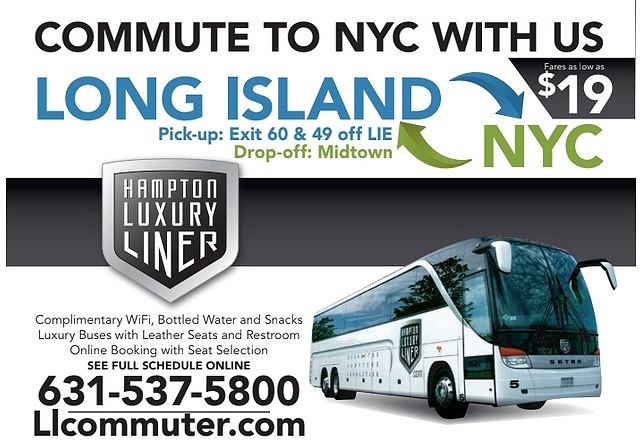 Subject: LongIsland.com - Your Name sent you Event details of "Commute to NYC with Hampton Luxury Liner"
Hampton Luxury Liners has become a favorite for Long Island commuters thanks to their LI to NYC service! With pick-ups at Exits 60 and 49 on the LIE, the luxury buses take Long Islanders to and from Midtown. Features include complimentary WiFi, bottled water and snacks, leather seats, restrooms, online booking, and seat selection. Visit Hampton Luxury Liners' website to book your next trip or call 631-537-5800 for more information.